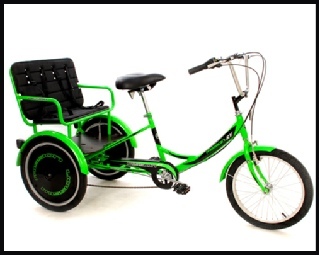 The 24 inch wheel trike is recommended for users over 5.4 inch and taller and up to 16 stone in weight. Minimum inside leg from saddle to pedal, not to the floor, as your feet do not need to touch the ground, 28 inches. A large basket is fitted to the rear frame to carry some basic shopping. 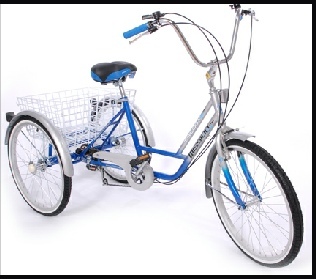 This trike model has a parking brake fitted to the front & rear brake. A Great new alternative to the Trikidoo child carrying tricycle. It's instinctively been adapted for a safe and stable way of transporting two small children, and offers great value for money. The frame is designed with a twin child seat at the rear and has 2 safety harnesses to keep 2 small children up to 60KG, nice and secure. There is also some handy storage space underneath the rear bench. It is no surprise that it is already proving very popular with parents for school runs and family days out. V brake front and drum rear. 6 speed twist grip gears. Protective wheel discs on rear to stop little fingers. Very large Padded coil sprung saddle.